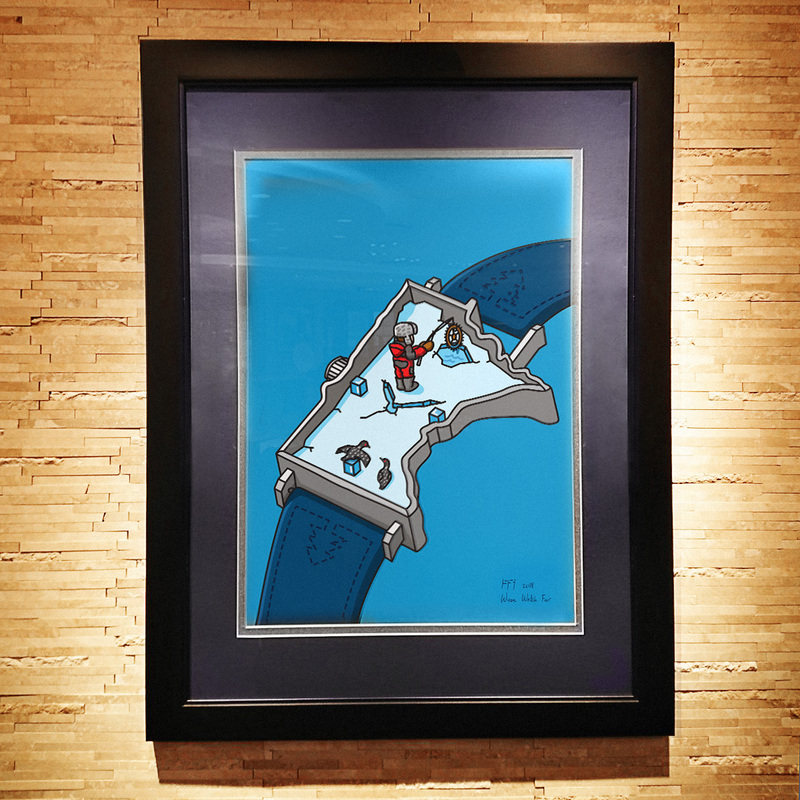 Known for his colorful and whimsical watch cartoons, Teun van Heerebeek is a burgeoning artist and cartoonist who has earned a lot of notoriety lately in the watch community. His illustrations have been featured across the internet, and he is a regular writer and contributor to Fratello Watches. As a self-proclaimed “watch nerd”, Teun started Watches & Pencils to combine his two passions—timepieces and illustration. Wixon Jewelers worked with him to create a limited edition watch cartoon for this year’s Watch Fair that is uniquely Minnesotan. We caught up with Teun to learn a little more about him, his process and the project. Tell us about your background, Teun. Where did your passion for art and watches come from? I grew up in a small village in southern Netherlands and quickly discovered that I inherited the creative brains of my granny and mum. Drawing is my true passion and I enjoy that you have the power to create anything. I was initially attracted to watches because of their rich combination of technique and design, and the craftsmanship on a very small and detailed scale. Watches and Pencils is simply the intersection of my passions—they are illustrations by a watch fan, for watch fans. Your illustrations are certainly designed for watch fans, but they also usually incorporate humor. Why is this? I’m a fan of comic books, clear lines and colorful work. I believe each of these elements are apparent in my illustrations and clearly define my style. Two of my artistic influencers are Hergé (the creator of The Adventures of TinTin) and Keith Haring. During my studies, I learned that humor is an important aspect of art and a powerful weapon. I try to include a humorous aspect or situation in each piece that is clearly related to the featured watch. Watches and Pencils is my stage to tell, criticize or simply illustrate watch related matters with a humorous twist. You created a special Minnesota-themed watch illustration for our Watch Fair this year. What was your vision for this drawing and how did it come together? Honestly, I didn’t know much about Minnesota prior to starting this project. I only knew that it was a nice state in the USA with a lot of lakes and beautiful forests. I learned that ice fishing is a favorite pastime during your winters and I wanted to incorporate this into the illustration. Some typical Minnesota themes immediately formed a picture in my head with watch-related components. I combined them and the foundation for the final piece was born—an ice fishing scene atop a watch case in the shape of Minnesota. A boy is fishing on a frozen lake but instead of pulling up a fish from his ice hole, he catches a watch gear. From the case shape and the pine tree stitching on the strap, to the ice block hour markers and the loons, you’ll notice several Minnesota-themed elements within the illustration. How do you dream up these concepts and find inspiration for new illustrations? Inspiration often comes from unexpected places. You cannot force creativity. An idea can pop into my brain while driving home, or reading the latest watch-related news and blogs. I spend a lot of time working on the basic concept and idea. This is so important because it is the foundation for everything that follows. The creative process begins by translating the idea into an analog sketch that helps form my interpretation of the piece. With everything I draw, I try to truly visualize the soul and key aspects of the object. After several pencil drawings, and when I am satisfied with the rough sketch, I begin the long digitalization process in Adobe Illustrator. I often refine each element on the computer several times until I’m satisfied with the characteristics and definition. If you could snap your fingers right now and add any watch to your collection, what would it be and why? An original and mint Rolex Explorer—Ref. 1016. It has such a balanced design with a great history. The watch is simple, legible and nicely sized. It is a piece that served as inspiration for countless Rolex and non-Rolex watches. I love it on the steel bracelet, but it also looks good with all kinds of leather straps. » Have questions about a particular timepiece, our availability or pricing? Ask Our Experts!